One of the greatest feelings on Football Index is when your portfolio is on the up. It is the result of patience, good trading or sometimes luck! However, sometimes we can’t always be on the player that has risen, but this doesn’t mean the chance to make money has vanished. I speak (from experience) below. I like to ‘follow the market’ when I decide who I want to add to my portfolio. What I mean by following the market, is to check similar players prices. For example, If I am looking for a forward in the below screenshot, and I want to pick from the Top 10 Forwards. The reason I have decided the Top 10 is because they stand in contention for Media & Performance buzz. The first thing I will physically do here is look for the market expanding, but with some players not having yet ‘taken off’. 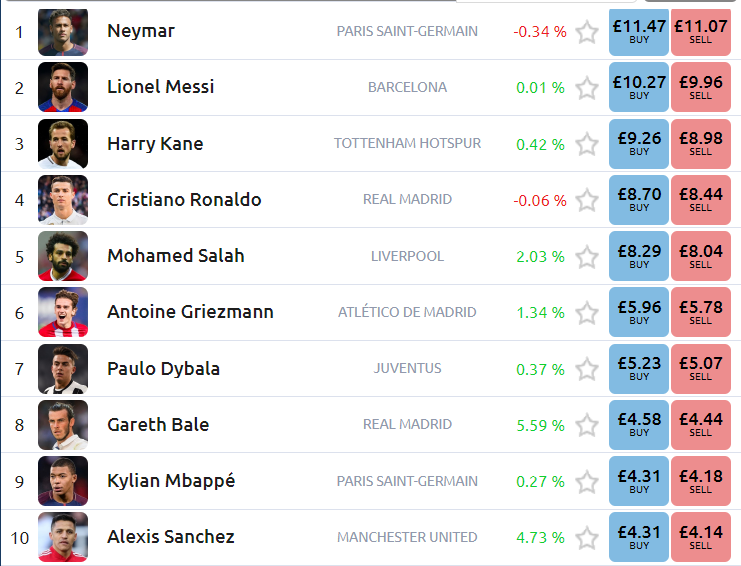 Now, this isn’t the greatest example as the market completely boomed last weekend, but instantly you can notice a noticeable gap in between Dybala and Mo Salah. There is over £3.00 difference in between the two players, which, for the current season Dybala has returned £0.43, Salah £1.00 in Dividends. I would suggest that the gap in price for these two players would close up. Griezmann has returned just £0.17 this season, but there is forever speculation that he’s leaving Atletico Madrid, so I think his price is high as a potential Barcelona move is on the cards for him. Mo Salah has risen tremendously this season, but I am reserved to comment on this until I see if he can do this for another season! He has the potential to either become a ‘Top Player’ if he proves his consistency, or Football Index will experience the fall of a one-season wonder! I missed out on purchasing Mohamed Salah, I saw him rise over £1 in 12 hours, yet every time I logged onto the app, I felt it was ‘too late’ to buy him. However, as the Index grows, traders see that this opens up value in other players. If Neymar reached £50 a share, everyone would be clambering to purchase Messi at £10 a share as this shows immense value compared. If you compare the history of player pricing, they all seem to ‘follow’ eachother with rises. Look below at Ronaldo & Messi. As one rises, the other also rises. This is because traders see that if one player rises, the player that hasn’t yet risen looks like he has additional value & next to rise. Just as an example, if Messi rose to £20, with Ronaldo being around £8 would cause all the traders to get on Ronaldo, as he’s on par with Messi but pricing shows he’s half the player that Messi is. I used to become quite frustrated when I missed out on players, or sold too soon. For example, I sold Salah at I think £1.90. Either way it was definitely less than £2. Do I regret it? Only because he’s now worth £8! However, the reason that he’s priced at £8 is because the market has evolved so much. I would have never planned to keep Salah past £3/£4, as that was Griezmanns price at the time. However, the whole market has evolved, which now shows Griezmann at just over £6. I think I will always feel slightly annoyed that I didn’t hold on to Salah, as the prospec of seeing my £1.90 player become worth £8 would be immense. However, the truth is, during the growth period, I would have definitely sold him around £3 and invested in a better forward. Although I didn’t hold Salah when he rose immensely, I felt the affects of Neymar & Griezmann rising. You can spend £6 on a Griezmann, £8 on a Salah or £11 on a Neymar. It certainly makes Griezmann look like a great option, cheaper than Salah!